Soft Tissue Release was developed as a treatment for Olympic athletes. However, the approach can be used to treat any type of muscular injury . During soft tissue release the therapist first applies manual pressure to a muscle and then brings the muscle in to a pain free stretch in order to elongate and rearrange specific muscle fibres for more efficient function.When performed correctly, soft tissue release does not generally increase the level of pain beyond what body is already experiencing. Most massage treatments are characterized by the passive state of body tissues as these tissues are handled, stroked, kneaded, and manipulated. In soft tissue release, the tissues are instead held in distinct positions and then moved or lengthened. This approach makes it easier for a Physiotherapist to assess the texture, tightness, and movement of the tissues. Practitioners are then often able to identify specific areas in need of treatment, particularly when they are addressing areas with multiple layers of muscle fibers moving in different directions. During soft tissue release, the Physiotherapist first applies manual pressure to a muscle to form a temporary false attachment point and then brings the muscle into a pain-free stretch in order to elongate, untangle, and rearrange specific muscle fibers for more efficient function. Applying pressure to the stretch helps correct muscular imbalances in injured or scarred tissues and also works to remedy complex soft tissue dysfunction involving many groups of muscles and holding patterns. Passive soft tissue release, which can be very relaxing, tends to produce a good release of tension. Passive work is often performed to warm up the affected area before the active therapy is introduced. During active treatment the therapist may apply precisely directed pressure to the affected area and instruct the client to perform a corresponding movement. The combined effect is typically effective for reducing tension, freeing scar tissue, increasing movement, and reducing pain. When is soft tissue release used? According to Deyo and Chawkins (1996), 95-98% of all chronic pain is of a soft tissue origin. 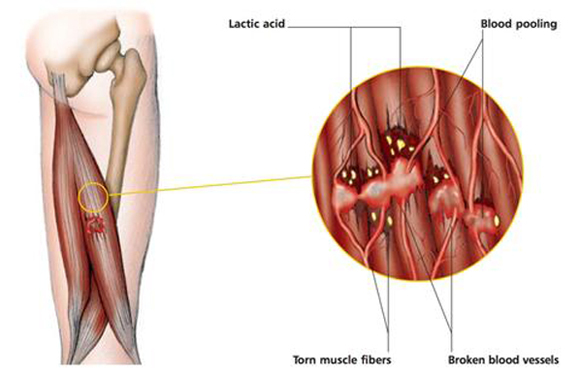 The advantage of using STR to treat chronic muscular pain is that it can target small areas of muscle precisely. So, for example, carpal tunnel syndrome may respond well to precise, gently applied soft tissue release. Broad-stroke passive STR can be a very effective pre-event warm-up treatment. It’s important that the technique isn’t applied too aggressively, though – the aim is to warm the muscles up here, not to increase range of movement. STR can really come into own post-event, to help stretch out the muscles, especially after long races. The focus here, is usually on the major muscle groups, such as quadriceps or hamstrings. Using soft tissue release, chronically hypertonic (tight) bundles of muscle fibres can be stretched whilst the surrounding normally pliable muscle fibres can be left untouched. It’s this specificity which gives STR it’s real power as a therapeutic technique in the clinical setting. Soft Tissue Release (STR) is a dynamic, highly effective technique that has an immediate and powerful effect on muscle and connective tissue. STR is a combination of Myofascial Release, Therapeutic Massage, and Active Assisted Stretching. The technique involves applying precise pressure during a specific stretch performed in multiple planes of movement. The goal is to appeal to the autonomic nervous system in a way that leads to spontaneous release of the injured muscle, thus regaining the original resting length of that muscle. The result: fast and permanent reorganization of scar tissue, the targeted muscle(s) return to the proper resting length, muscle imbalances are corrected, associated pain is decreased or eliminated altogether, and muscle performance is improved. Results are often obtained quickly. These techniques can be applied to soft tissue injuries in both acute and chronic situations.